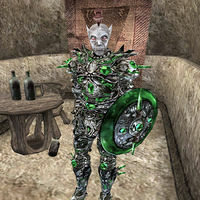 Mertis Falandas is a Dunmer crusader, who lives on the lower level of the Tower of Dusk in Ghostgate. He is the master trainer in Spear, and also one of only two people in the game who provide training in that skill (the other being Flaenia Amiulusus). He also offers training in Long Blade and Block. Note that he is located behind a locked door. You will not be attacked or suspended from the Tribunal Temple for trying to open it. He wears a near full set of glass armor, including the cuirass, both pauldrons, greaves, boots, and shield. He also wears an expensive shirt with matching pants and he carries a glass jinkblade and a key to the Tower of Dusk vault. Aside from his natural resistance to fire and the sanctuary provided by his ancestors, he knows the following spells: Deadly Poison [Ranged], Dire Weakness to Fire, Dire Weakness to Frost, Dire Weakness to Magicka, Dire Weakness to Poison, Dire Weakness to Shock, and Daedric Bite.